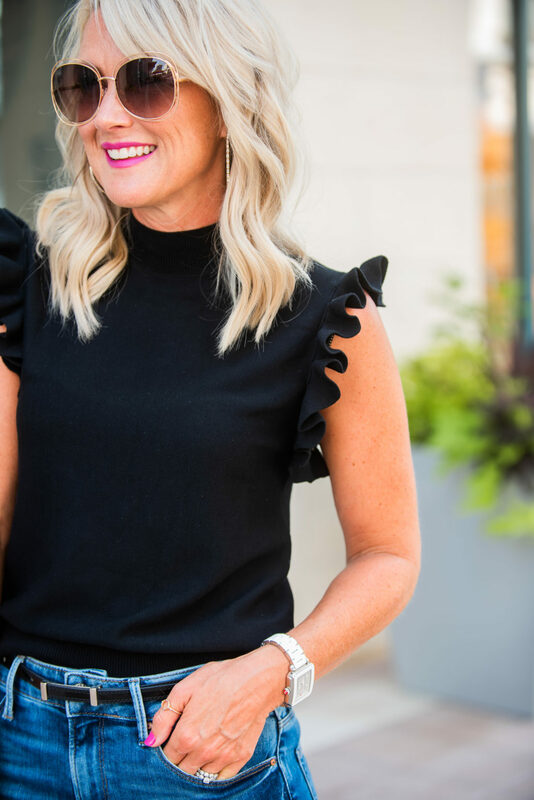 Now & Later | Ruffle Trim Sweater | hi Sugarplum! Welcome back to a new week, friends! How was your weekend? Our kids leave for one last camp of the Summer this morning, so we soaked up a lot of family time while we could. If you follow me on Instagram, then you likely saw our shenanigans on my Story. There’s seriously never a dull moment with this bunch. No doubt I’ll miss them this week, but I’m pretty excited about having a quiet house…and hopefully a date night or two. 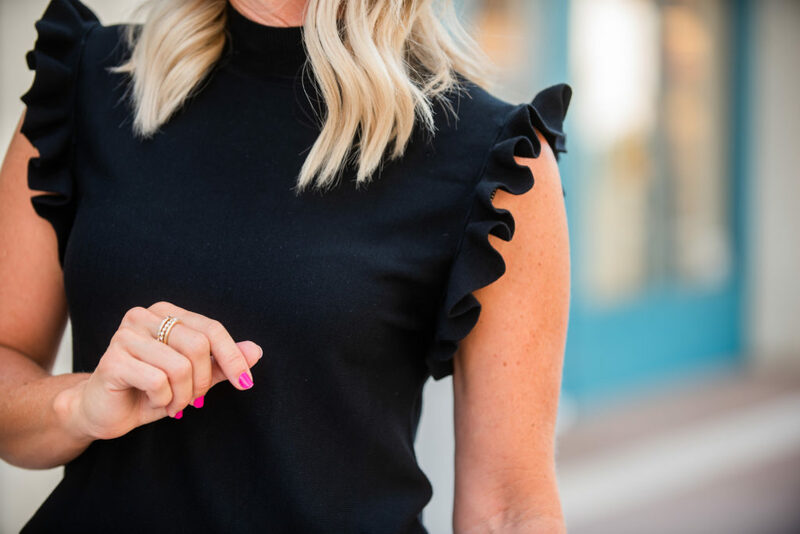 Today I’m excited to share two styles for work and weekend, featuring a darling ruffle sleeve sweater. Yep, I photographed a sweater in 105-degree heat…that’s how excited I am about this new piece! You know you’re a blogger when you risk heat stroke for a cute sweater! But y’all, it’s really cute…and on sale! I love pieces that have a classic shape and fit, but with special details, and this one fits the bill. It’s a fine gauge pullover with a mock neck and a double row of firm ruffles. It comes in several colors, but it’s hard to go wrong with black. Fit Tip: It’s a relaxed fit…but I prefer it more fitted, so I’m wearing an XS petite. 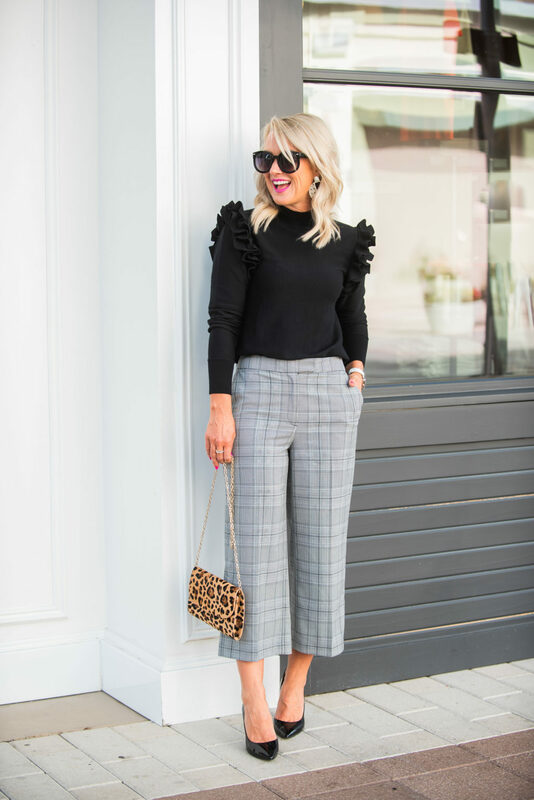 For a fun workwear style, I paired it with these classic plaid pants with a modern cropped length. 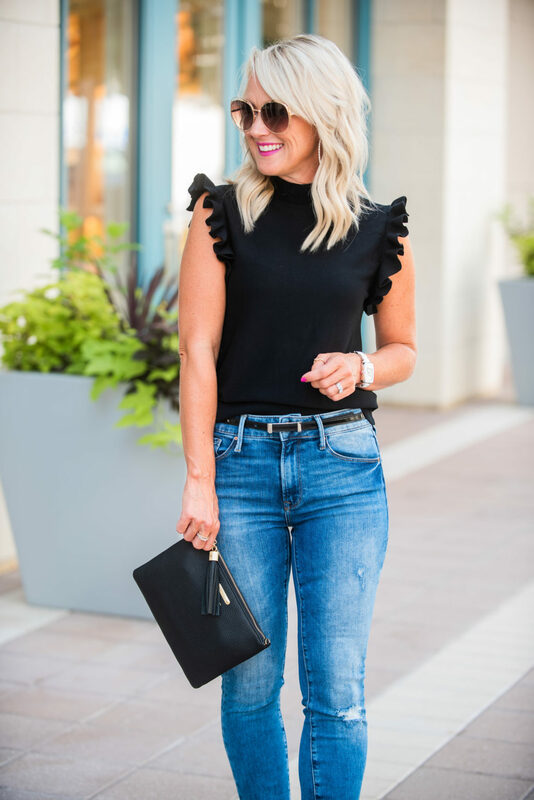 They’re a great weight for wearing year-round…I love them with these patent pumps, and they’d be so chic over knee boots when the weather cools. 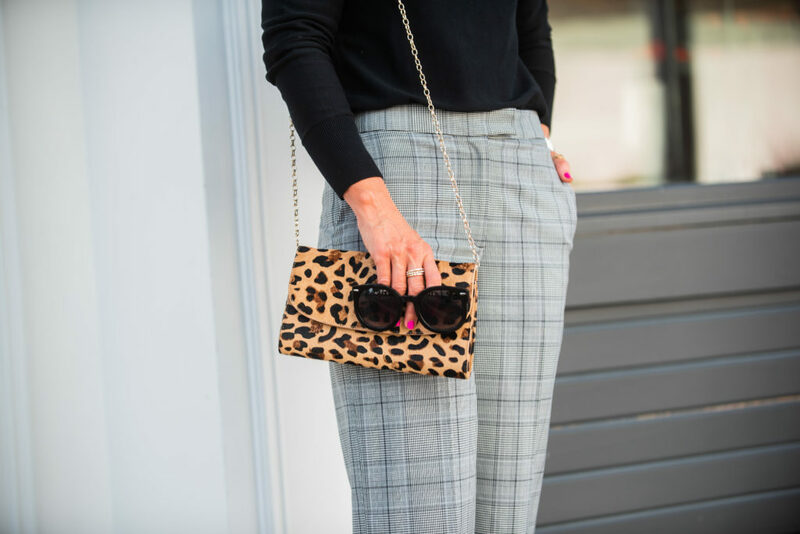 The leopard bag can be worn with the strap, or tucked away as a clutch. Fit Tip: I’m wearing a 2p for a defined cropped length, but would prefer the looser fit of a 4p. So I’d say size up one in petites. 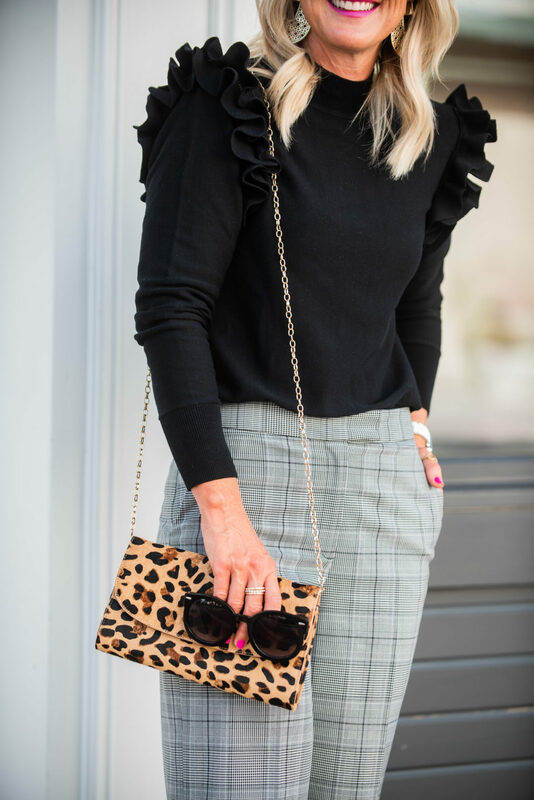 The styling options are unlimited with the sleeves, but to make the sweater even more versatile…look what happens with you remove the detachable sleeves! So fun and flirty, with a touch of sass! I paired it with my new favorite distressed jeans and leopard pumps for a casual night out style. It would be cute with a pencil skirt, too. The jeans have a comfy mid-rise, with a raw hem and just a touch of distressing. I love the lighter wash and minimal whispering, but it’s the fit and comfort that swayed me. Fit Tip: They’re true to size, I’m wearing 26. I’m 5’4″ and they fall just below my ankle, so they’re intended to be cropped. Every woman needs a good leopard heel in her closet, and these are a perfect addition. They style for both work and weekend, and the heel makes them both modern and comfortable. 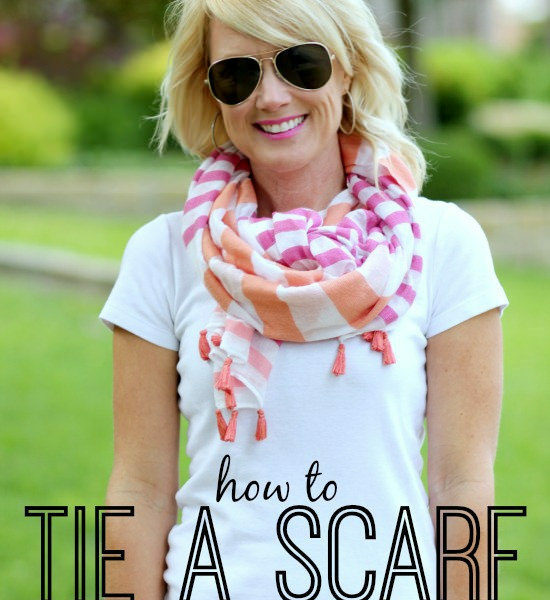 So many options with this fun, versatile sweater! But you know I’ve never met a ruffle I didn’t love. Oh, and the sleeves reattach easily with a single zipper. It’s like two tops in one…and it’s on sale! Happy Monday, lovebugs, I hope it’s a good one. 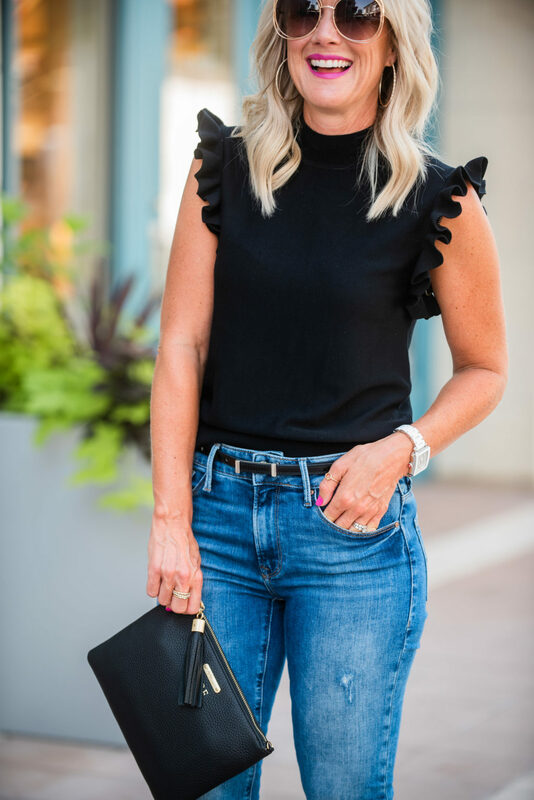 previous article: Dressing Room Diaries | Nordstrom Anniversary Sale Open to ALL! Seriously such a cute top! 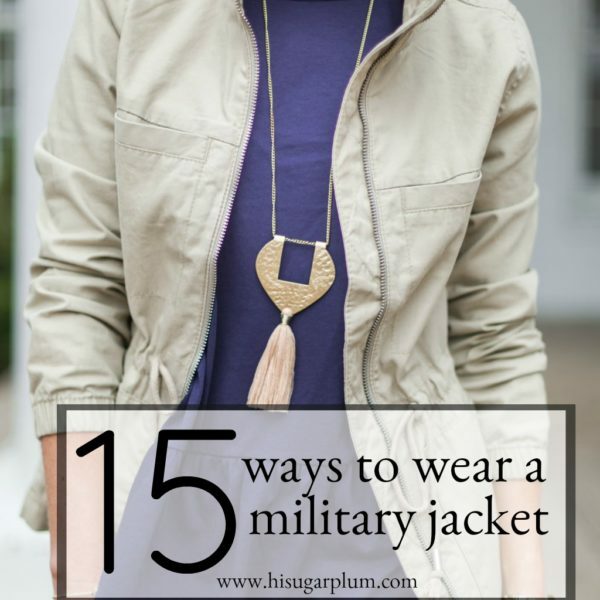 Perfect for Texas Fall weather when it’s chilly one day and HOT the next. Enjoy your quiet week! I’m jealous!! OMG!!! Is that a Michele watch you are sporting?! Wowza, Sugarplum! I love it and am super jealous! Interesting that you linked it…it’s not your every day purchase. Yes, I know you had a special anniversary and yes you deserve only the finest, but I am thinking it’s time to choose a lane. Cheap and cheerful (JC P) or investment pieces. Either way, you are a hard working blogger, and deserve all the excess!!! Or maybe the HILARIOUS Mr SP made the purchase…ahhh to be in your world… it’s what dreams are made of! Whoa there, Liza! Yes it’s a Michele watch, but I scored it for under $300 in the Nordstrom Sale! So less than even my beloved Kate Spade watch that I’ve worn every day for the last 4 years. This new one sold out in a hot second (like I knew it would at that price, which is why I shared it on opening day of the sale so my readers could grab the same great deal), but I linked it today in case it restocks. 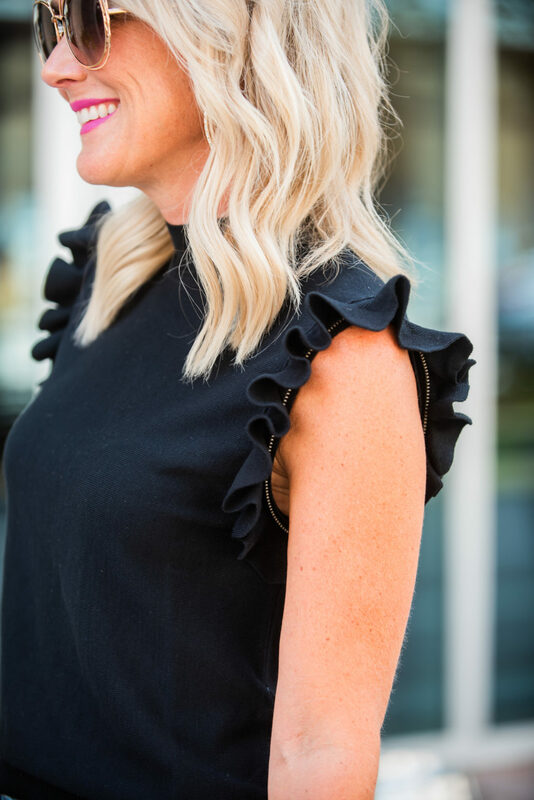 I’ve always mixed the high and low, and investment pieces that I wear for years and years are a great place to go with quality. Cassie you deserve the world’s best! You will always be blessed and your loyal fans (count me in) love you so much:) Keep smiling your gorgeous smile, and show everyone your beautiful eyes-filled with love and kindness. The shoes are my favorite look today. 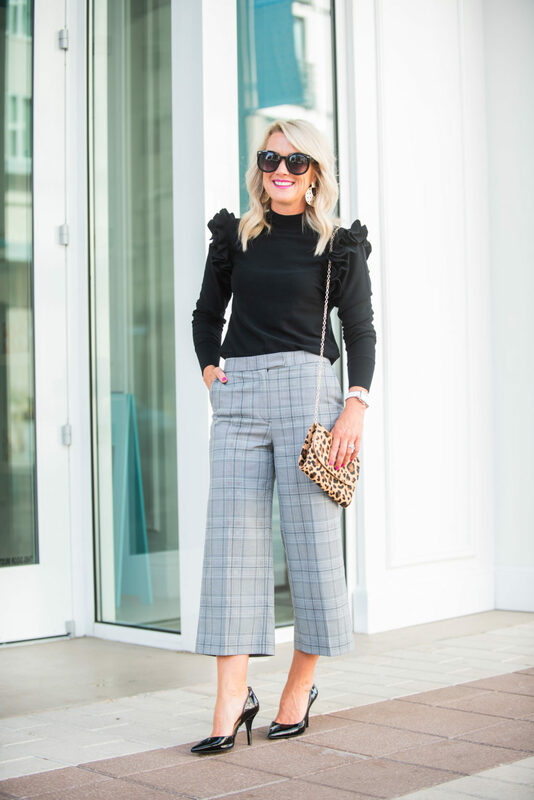 Could you please show the plaid cropped pants styled for fall? Black booties maybe. I live much further north than you and think my fall would include something other than pumps. Hi Dina! I’d style them the same for Fall, but maybe swap a knee boot for the heel if it’s too chilly for bare ankles where you are. I love a knee boot under cropped wide leg pants! Cassie you look so pretty in this black top. I love it and also love your hair in these photos. 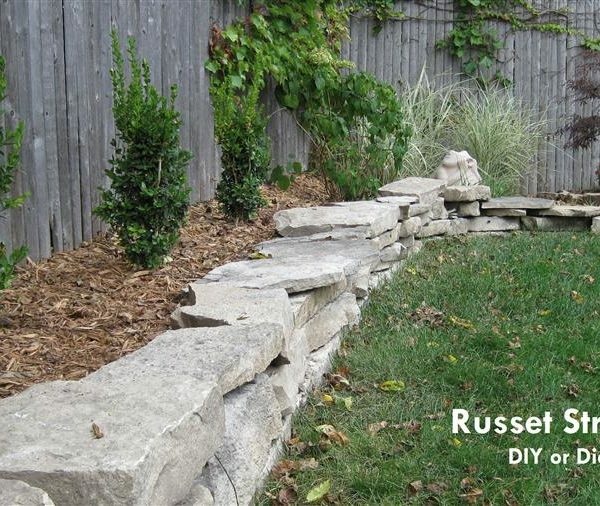 Thanks for sharing such gorgeous finds. DANG these are cute outfits!!!! And my goodness those heels!!!! I love your blog and you are one #blessed mama. I am saddened that you had to defend yourself against Liza. Yikes…I don’t think she conveyed her point of view appropriately. If I am being honest, a Michele watch, even at under $300 is not attainable for me. Of course it is an investment piece, but I am right at your age, and it’s not possible. So, while yes, I love your blog, it’s not my reality. I, too, am 20 years in, but our anniversary will not include Kauai. My husband and I work countless hours to support three kids. I realize we only see the highlight reels, but it’s just hard. I do think (and this my opinion, so need to lash out) that you tour products…Gibson, JC P, eBay, etc. that work for a lot of folks, but you indulge…it’s a mixed message. You are not the same Cassie….and that’s ok, you have arrived. However, I would love for a post to about chicken piccata and not eBay cookware. I hope you understand. 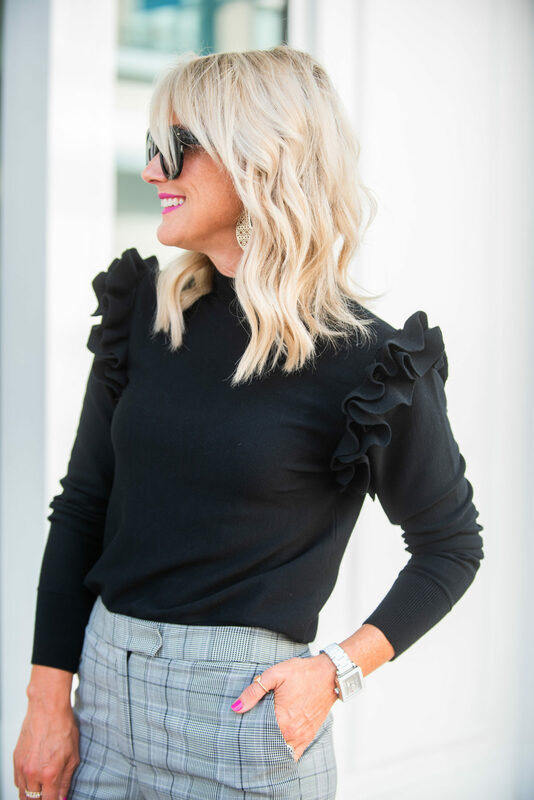 Love this ruffle sweater!! So cute. Seeing it on you makes me want to try it. Looking at it on the website however, I easily would have passed it by in a hurry. 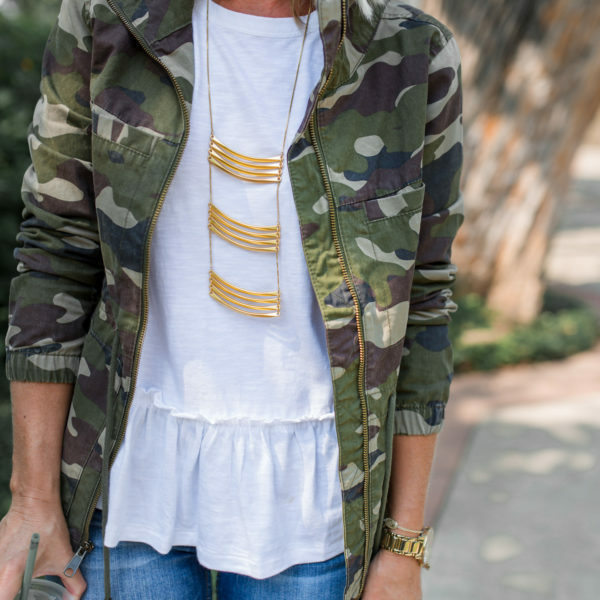 Thanks for checking it out and showing us how to style it!